I don't think there's any other pianist who has surveyed significant chunks of this repertoire with a sharper ear for the way that details of texture, rhythm, and articulation interact. (...) A prodigious release. As with his recordings of the sonatas, Raekallio proves himself completely at home with the composer's many idioms. (...) A real charmer. 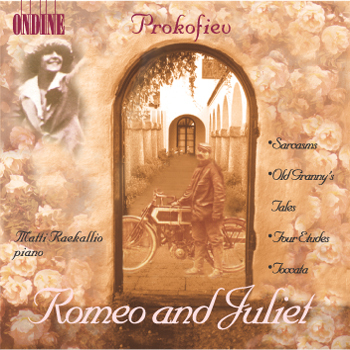 This CD features Finnish pianist Matti Raekallio with much of Prokofiev's best non-sonata piano music, including the Romeo and Juliet transcriptions and the famous Toccata. One of today's most prolific specialists in Prokofiev's piano music, Matti Raekallio also provided the liner notes. He earlier recorded the complete Prokofiev piano sonatas (ODE947-3T).